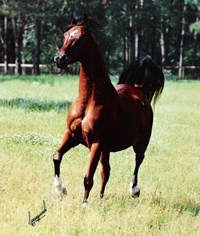 We purchased the Swedish legend *Sagana from Freeman Arabians, who set a record price importing her. The story of this mare is perhaps the most heartbreaking for Maplewood’s history, as we lost her Negatraz daughter in foal to Erykk MF with a filly. She would most certainly have been a cornerstone for athletic beauty had she survived. *Sagana was sold in a period of downsizing for Maplewood in the 90s to Peach Creek Farm. A ‘stallion-like’ forceful mare, quite unique in her power and presence, we have none of her blood left, most unfortunately.